PORTLAND – Eager night owls looking to score some of the first recreational pot in Oregon bought up baggies of bud at shops that opened early Thursday, some taking advantage of door-buster deals. Some of the more than 250 dispensaries that already offer medical marijuana welcomed lines of enthusiasts soon after midnight – just moments after it became legal to sell to anyone who is at least 21. There were no reports of problems from early sales, although most stores planned to open at a more reasonable hour. At Portland’s Shango Premium Cannabis, co-founder Shane McKee said the first sale to an excited customer came about a minute after midnight, with many others waiting. He called the moment significant. “I think it’s not only historical for folks in Oregon but nationwide – anytime people start selling that as an alternative to alcohol or tobacco,” he said in a telephone interview shortly after midnight. The first buyer at McKee’s store, Davia Fleming, of Portland, said the atmosphere was upbeat for the launch of the new industry. “It’s the end of a prohibition,” said Fleming, who uses the drug for medicinal purposes. The store offered its first 25 customers a 35 to 40 percent discount and was handing out soda, coffee, juice and other refreshments, McKee said. 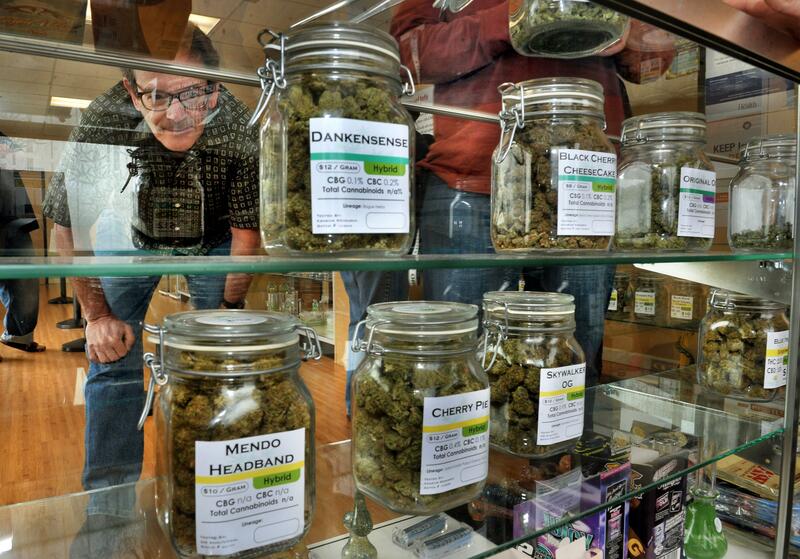 Many stores in Oregon were trying to lure customers with extended hours, food giveaways and discounted marijuana. Shoppers have one more incentive to buy early and often: Under Oregon law, pot purchases will be tax-free until January – a savings of up to 20 percent. Store owners say they are hopeful they can avoid the shortages and price spikes that followed the start of legal sales last year in Washington and Colorado, the only other states where the drug can now be sold for recreational use. Alaska could begin retail sales next year. One store offered a goody bag with T-shirts, but no free marijuana. Another will have a live band and 10 percent discounts. The marijuana review site Leafly will set up food trucks at a handful of stores, giving away free meals to anyone who promotes the service on social media. Customers can buy as much as 7 grams at a time of dried marijuana flower and leaf – the part that’s generally smoked – plus plants and seeds. For the next year or so, pot-infused candy, cookies, oils and lotions will be available only to people with medical marijuana cards as the state works on retail regulations for those products. Oregon has a robust supply system that has supported medical marijuana users and the black market. Companies have invested in massive warehouses in Portland to grow the drug indoors, and southern Oregon has some of the nation’s best conditions for outdoor cultivation. Still, there is concern. Summer has historically been a time of marijuana shortages in Oregon, and most of the outdoor crop is not ready to harvest. Indoor growers have had minimal time to ramp up production, because lawmakers only approved the Oct. 1 start date three months ago. Green Oasis, which has two locations in Portland and more on the way, has prepared by trying to cultivate strong relationships with growers. The business planned to entice customers Thursday evening with an outdoor band and offer a 10 percent discount to those who spend at least $40, co-owner Matthew Schwimmer said. “We don’t know of anyone else doing a band, and we thought it was a good idea to give back to the community,” Schwimmer said.